We are a semi-retired couple from Canada and discovered Isla Mujeres while we were travelling around the Yucatan. The turquoise water, white sand beaches and sunsets were stunning. We enjoy the friendly people that we meet on the island and also the wonderful restaurants and relaxed atmosphere while walking through town and the safety we feel everywhere on Isla Mujeres. The people of Isla Mujeres are some of the kindest and most gentle people we have ever met and it is a wonderful destination for a relaxing Caribbean holiday. 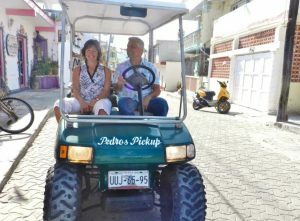 Renting a golf cart is a fun way to see the entire island and bike riding is also another option. Running or walking the ocean walk-way and the coast of the island is something that we do everyday and we look forward to it each morning. Waking up and watching the sunrise is a marvelous way to start the day – and it’s amazing to only have to open your eyes and watch the wonder without even getting out of bed! We are constantly impressed by the view of the ocean from everywhere in the casa and we feel very blessed to be able to share this with you.